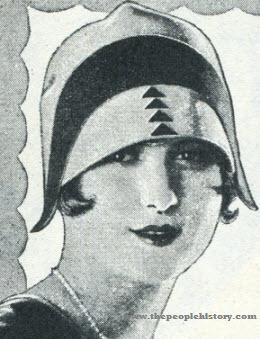 Twenties Fashion Accessories From the year 1927 including prices, descriptions and pictures for Ladies and Gentlemens hats, jewelry, scarves etc. Description This three-eyelet tie illustrates how exceedingly attractive brown alligator leather can be made by applying a bit of rose blush gingham leather as trimming at proper points. Certainly a harmonious blending of colors. 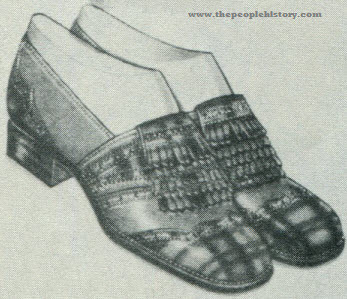 In addition there is a covered wood military heel. New Parisian shape toe. 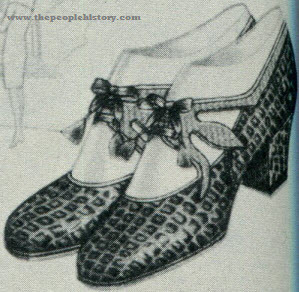 Description Have you ever seen a "Snappier" shoe in your life? It's the choice of thousands and we selected it after visiting all of the shoe centers of America. 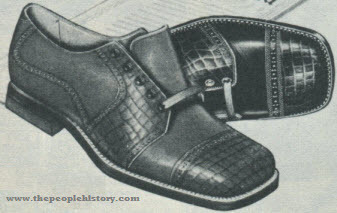 Real calf-skin upper Alligator trimmed, oak bend sole. 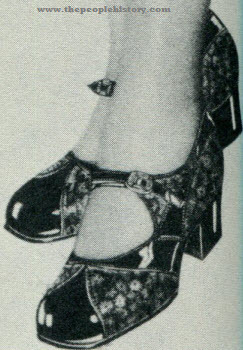 Rubber heel. Description Misses and young women delight in this snug fitting mode. So light in weight it conforms perfectly to your head. 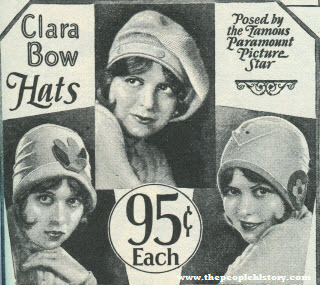 Made of extra fine quality millinery felt. Neatly tailored with machine stitching and tucks. Fancy, contrasting cutout designs of felt trim either side. Description Cheerful cutout appliques enhance the beauty of this stylish, close fitting shape. 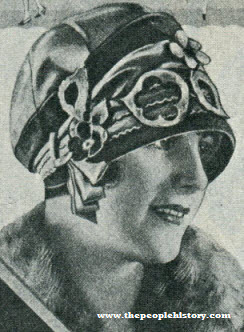 Features new tam drape crown. Made of lustrous bengaline with high grade silk Lyon's velvet brim and velvet fold in crown. Rows of novelty braid and side ribbon loops complete the trimming. Silk lining. Description Nifty flapper style of full body felt. Tinted felt is clever "halo" trimming, having late style point at either side. Felt strip finishes back. Tiny ornaments also of felt. Silk lining. Dandy value at this low price. Description Here's the Gold Bond Sport Oxford, stylish with its tan or black alligator trimming contrasting the light color sport leather. Made like all Gold Bonds--as real shoes should be. Oak sole. 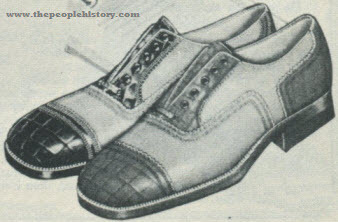 Rubber heel. Genuine Goodyear welt. Description New "halo" turban is quite dressy in this showy makeup. 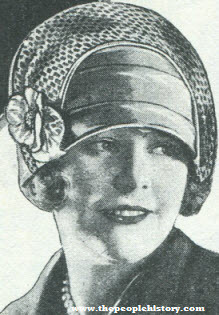 Made of lustrous millinery faille. Fancy fold across top has overlay of fancy metallic net. Novelty gold color flower to match, silk lining. Description Very attractive. 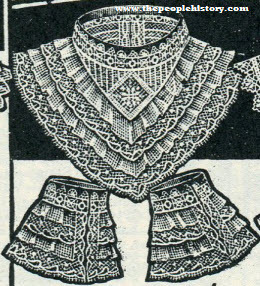 A beautiful combination of imported cotton net, Valenciennes and Venise lace, with hand crocheted medallion. Collar and cuffs edged with black silk ribbon, light ecru. 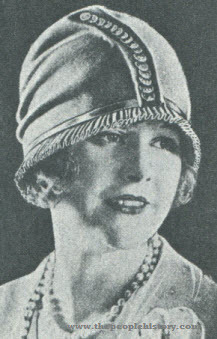 Neck wear and cuffs. Description Men's popular Judge style cap, made of good quality wool mixed Thibet cloth. Good quality twill lining. Indestructible canvas visor. Inside turndown lined band. Description Excellent quality made up band bow tie. Has appearance of hand tied bow. Adjustable band that will fit any size collar. 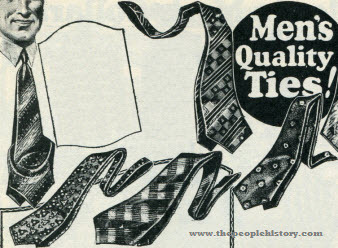 Description High grade neckwear in attractive patterns. Made of the better grade neckwear silks in the popular colorings. 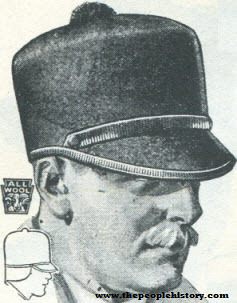 Non-wrink-able wool lining. Description Stunning pouch bag of fine morocco leather, with leather covered frame and trim in snake effect. Imported gold color fittings on center frame in shirred compartments. Beautifully lined. Coin purse in pocket. Choose from black, brown, gray, tan, blue, red, or green. Description Beautiful daisy Paisley leather one-eyelet sport style with black patent leather trimming. 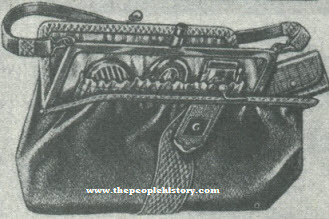 Strap runs through eyelets with metal buckle which fastens in front. 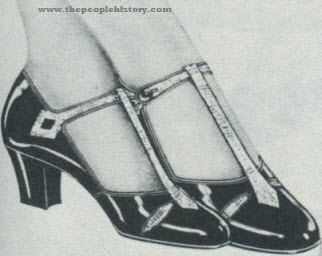 Its low one and a quarter inch patent covered wood heel and round new boulevard last impress you as undeniably collegiate. Description You can always rely on patent leather being in good style. When made up in a front strap model that sets smoothly over the instep you may be sure that your feet are becoming to the most critical observer. Black and white leather enhances the vamp and front and side straps. Shapely new Parisian last. One and three quarter inch covered wood military heel. It is sure to win favor. 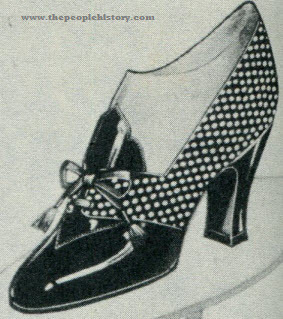 Description Indicative of the style trend is this black patent leather two-eyelet tie model, with polka dot patent leather quarter. The covered wood spike heel, two inches high, and the attractive new modified Parisian shape toe lend an air of style distinction that you will be proud of. 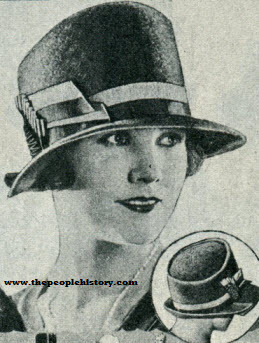 Description Smart, pleated ribbon brim is an important style factor this season. Here on a crown of softly draped full body felt it is most adorable. Richly trimmed with novelty gold color discs to match metallic ribbon band. Very dressy and distinctly unusual. 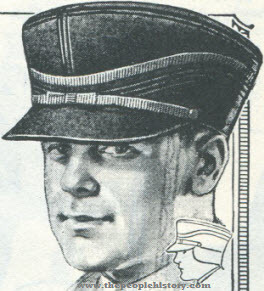 Description Men's Scotch style cap. Made of all wool, closely woven, fully shrunk, knitted cloth. Felt lining. Inside turndown band. An extremely warm and comfortable cap priced exceptionally low. Description In shopping centers, on campus and on the boulevards of our big cities, where one may casually observe the best and latest creations of fashionable footwear, will be found a goodly assortment of sport styles. This brand new "Collegiate" sport shawl pump comes in tan calfskin with shawl tip and quarter in brown Scotch design leather. New round boulevard last, 1-inch heel and genuine Goodyear welt soles. Elastic front goring under bow insures perfect fit. Description Good quality imported linen with pearl button cuff links. One of the nobbiest sets we have ever shown. Colors include white ecru, delft, jade, russet, or orange. Description Most stylish shape for well dressed women of the full face type. Stunning new telescope crown. Made of extra fine quality clipped fur velour. Brim has smart, divided feature at side. 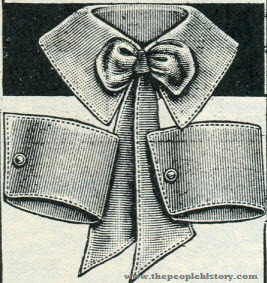 Handsome, two-tone banded trim with smart pleated arrangement at side. Full silk lining.